Mix butter with Cajun seasoning and pepper sauce. Reserve 1 Tbsp mixture. Carefully pull back husks of each ear of corn, but do not remove corn from the base of the cob; remove silk. Fold husks back into place and soak corn in water for 10 to 15 minutes. Fold back husks and generously brush butter mixture over corn. Pull husks back over corn. Place corn over medium heat; close cover and grill for 20 to 26 minutes, turning every 5 minutes. Husks will become charred. Remove husks and brush with reserved butter mixture. 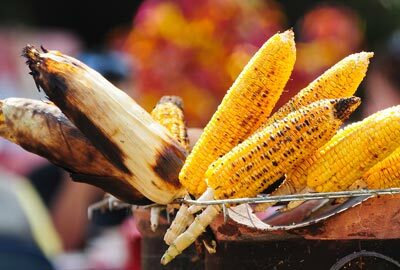 For more grilled flavor, place corn back on grill after removing charred husks and grill for a few minutes on each side under kernels start to brown. Remove from grill and brush with reserved butter mixture.